Welcome to Best Western Park Crest Inn! Our Monterey hotel is within driving distance to Carmel by the Sea and close to Cannery Row and Monterey Bay Aquarium for your enjoyment. We are just one mile to the entrance of 17 Mile Drive and Pebble Beach Golf Course, both great places for relaxing. Spend the morning on a legendary scenic drive and the afternoon working on your swing. At our Monterey hotel, relaxation is key. We are also within walking distance to Fisherman's Wharf and downtown, where an abundance of restaurants, shopping and sightseeing attractions draw guests in from around the country. 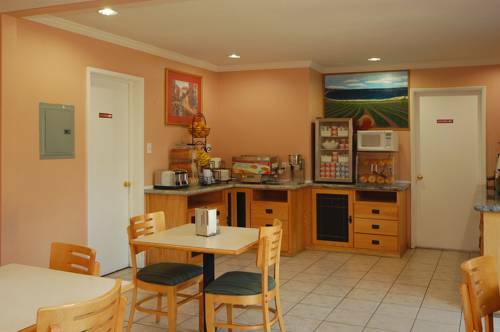 Centrally located to all attractions in Monterey, our Monterey hotel offers great customer service and cleanliness of the room at a reasonable price. The Monterey Bay Aquarium is a top attraction, but other guests simply like being within walking distance to downtown. The Monterey Bay Blues and Jazz Festival is another must see event. The AT&T Prom Golf Tournament at Pebble Beach is a popular event nearby, and the Moto GP Motor Cycle at Laguna Seca Raceways is a must for speed lovers. Our Monterey hotel is centrally located to all major attractions, and we even offer an aquarium package to our guests. With a free full breakfast and free parking, our staff is also committed to superior customer service to make each guests' stay enjoyable. Business travelers especially enjoy the prime location of our property. Construction crews, service men and women with the Defense Language Institute and Naval Post Graduate School, and attendees of corporate convention events all prefer our hotel. There's an event planner on-site and party rental equipment to help make a special event easier and better, from receptions to meetings. Enjoy luxury bedding and quiet, cool rooms at our Monterey hotel. Whether you are here for beach bumming or training, count on us to make your stay the best it can be. Book your Best Western Park Crest Inn stay today. From: Highway 1. If you drive, just take the Munras Avenue Exit off State Highway One and head North on Munras toward Monterey Bay. Getting here is easy! If you fly in, you are only minutes away by airport limo or cab.